WinWedge Software captures serial data, custom tailors it to your specifications, then transfers the data to any Windows application either by sending keystrokes to the application’s window or by passing the data through DDE (Dynamic Data Exchange) conversations. 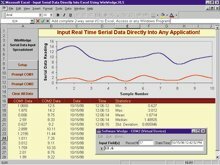 WinWedge adds complete data acquisition and instrument control any Windows application - Excel, Access, LIMS, MMIs, etc. It is easily set up in minutes, with no programming, using a fully menudriven configuration program. WinWedge collects data on any serial port* (RS232, RS422 or RS485) even multiple serial ports simultaneously and quickly diagnoses and corrects serial communications problems with a powerful “analyze” feature. It also transmits, prompts or commands out the serial port to control or query your instruments directly from within other Windows applications or directly from WinWedge. Think of WinWedge as a fully customizable serial I/O device driver. WinWedge has a simple, menudriven step by step set-up. With WinWedge you can easily eliminate slow, error prone manual data entry - without having to do complex and time consuming custom programming. WinWedge 32 Pro WinWedge 32 Pro is designed to collect data from, and control, any serial device, no matter how complex the serial output or how sophisticated the control required. Use it with industrial and laboratory instruments, quality and process control devices, PBX systems, PLCs, etc. supports advanced parsing, filtering and formatting of text, binary, hex, octal and ASCII data. WinWedge 32 Pro is a full 32 bit version for Windows 95, 98 and NT. It supports up to 100 com ports, and all 32 bit Windows features, such as long file names, and it is 30% faster. Expanded DDE support allows other applications to completely control WinWedge and all serial I/O. This lets you create extremely powerful data acquisition and device control interfaces from within any Windows application that supports DDE (i.e. Excel, Lotus, Access, etc.). Included with the WinWedge Pro package you receive TCPWedge software. TCPWedge lets you communicate with any TCP/IP network port address (Ethernet/ Internet) from any Windows application. It is just like WinWedge 32 Pro but for TCP/IP communications instead of serial I/O. WinWedge 32 (32-bit) are standard is designed to work with simple devices, such as bar code readers, electronic scales, calipers and gages, or any other device that transmits simple text data - either single field data, comma delimited data or fixed length data. It supports basic prompting and control of serial devices, selectable input buffer size (up to 32K), date and time stamps, and baud rates up to 19,200 baud. WinWedge supports up to 9 COM ports. WinWedge 32 supports up to 16 COM ports. • 30 powerful math functions including scaling, conversions, arithmetic and logical operators. • Hot Key activated output strings and Hot Key control. • A Pre-Input Character Translation table that can be used to simplify complex input data record structures. • Disk File Logging mode for serial data. Use it to log serial data to file in the background. • Extended support for 2-way I/O to give you more options for controlling serial devices. • Support for any serial data including Binary, Hexadecimal and Octal as well as ASCII. • Pro versions include FileWedge software. FileWedge easily inputs data from any disk file directly into any Windows application. FileWedge works just like WinWedge except data is read from a disk file instead of a serial port. System Requirements WinWedge 32 and WinWedge 32 Pro run under Windows 95, 98, NT, 2000 or XP. All versions of WinWedge will work with any Windows program. The Pro versions offer support for a far wider range of serial devices including advanced industrial and laboratory instruments. All versions are small applications that can run with minimal system requirements.